Your message has been sent to BrandenBowen . Like authorSTREAM? Give us a +1! 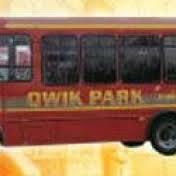 Qwik Park offering secure off-site parking services. We offer self-parking, free shuttle service 24/7, door-to-door pick-up and drop-off, online reservations and best rate guarantees. For more details visit our website. BrandenBowen uploaded a new presentation "Metro Detroit Airport Parking"
If you are a passenger and wish to park, use short term parking in the garage. We also provide fast and efficient shuttle services.